"Our smart pajamas overcame numerous technical challenges," says Trisha L. Andrew, Ph.D., who led the team. "We had to inconspicuously integrate sensing elements and portable power sources into everyday garments, while maintaining the weight, feel, comfort, function and ruggedness of familiar clothes and fabrics. We also worked with computer scientists and electrical engineers to process the myriad signals coming from the sensors so that we had clear and easy-to-understand information." Getting enough quality sleep can help protect people against stress, infections and multiple diseases, such as heart and kidney disease, high blood pressure and diabetes, according to the National Institutes of Health. Studies have found that quality sleep also increases mental acuity and sharpens decision-making skills. Yet most people do not get enough sleep—or the right kind.The National Sleep Foundation estimates that the sleep industry is booming, taking in nearly $29 billion in 2017. Although some manufacturers of smart mattresses claim the products can sense movement and infer sleep posture, they do not provide detailed information to the sleeper and are not portable for travel. Commercially available electronic bands worn on the wrist give information about heart rate and monitor how much total sleep the wearer gets. But until now, there has not been anything that a typical consumer could use to monitor posture and respiratory and cardiac signals when slumbering. 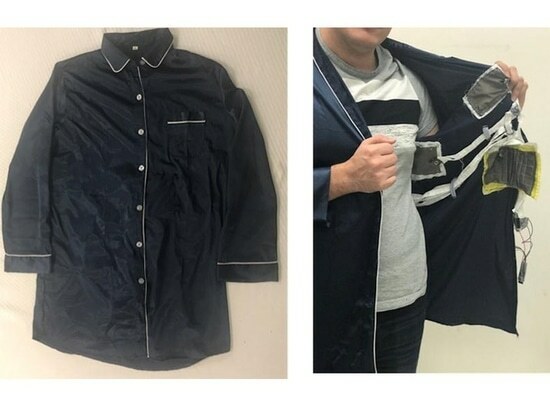 The "Phyjama," as the University of Massachusetts, Amherst team calls it, has five discrete textile patches with sensors in them. The patches are interconnected using silver-plated nylon threads shielded in cotton. The wires from each patch end up at a button-sized printed circuit board placed at the same location as a pajama button. Data are wirelessly sent to a receiver using a small Bluetooth transmitter that is part of the circuitry in the button.